Moreau was a new kind of heroine, whose glamour had no gloss, whose elegance had no airs, who seemed to burst fussy constraints with every word she spoke, every glance she shot, every step she took. 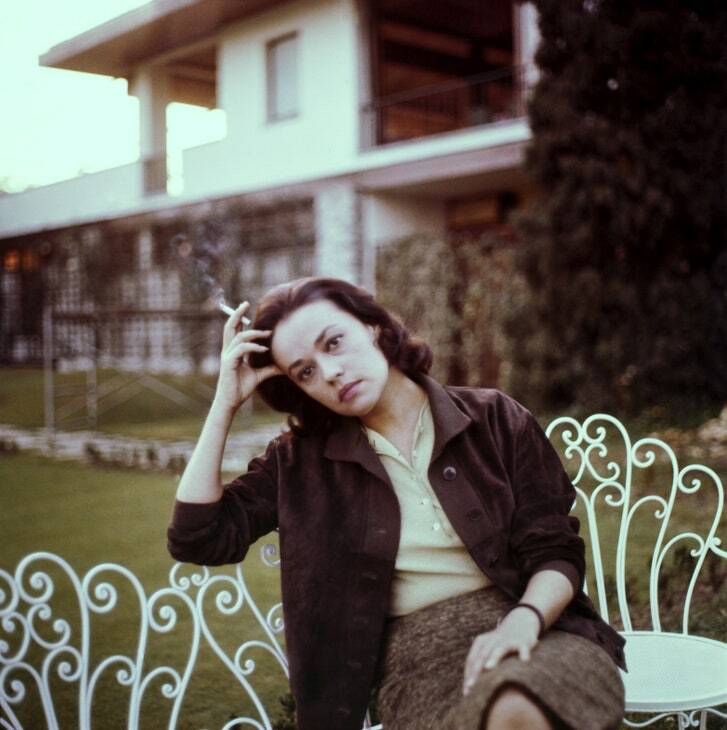 The idea of Jeanne Moreau is as great as the onscreen presence of Jeanne Moreau because, in her performances, she embodied ideas in motion, and, for that matter, one big idea: Moreau, who died on Monday at the age of eighty-nine, was a grande dame without haughtiness or prejudice. Her grandeur didn’t erect walls around her; it widened her vistas, increased her curiosity, enabled her adventures, overcame narrow boundaries. She was a queen of intellect—but an intellect that was no cloistered bookishness but an idea and an ideal of culture that enriched experience, envisioned progress, looked ardently at the times. Someone once wrote that Cary Grant looks like a person who’s thinking; I’d say he’s rather lost in thought, whereas Moreau seems at home in thought, standing on a solid foundation of knowledge that makes her searching focussed, precise, intention-sharp. If Alfred Hitchcock had known how to film heroic women, Moreau would have been the most Hitchcockian of active and intrepid women—and François Truffaut, who was among the most faithful and profound of Hitchcockians, recognized that trait when he cast her in “The Bride Wore Black,” one of his most conspicuously Hitchcockian films. Moreau spanned generations, not merely in her life and in her career but in her ideas and in the art of her times. A celebrated theatre actress in the conservative Comédie Française, she made her name in films with a director from the new generation—Louis Malle—who was in his mid-twenties and found in Moreau a new kind of heroine, whose glamour had no gloss, whose elegance had no airs, who seemed to burst fussy constraints with every word she spoke, every glance she shot, every step she took. Born in 1928, she was an artist raised and trained in traditions that she expanded without destroying; she embodied not the narrowly intellectual artist but the person of culture, and she also embodied the paradoxes of culture in an age when its own presumptions were being challenged. That’s why Moreau was an ideal actress for such analytical directors as Michelangelo Antonioni and Joseph Losey, whose dramatic schemes and visual compositions embodied the lure and failure of intellect, the delusions of reason. Her performance in Antonioni’s “La Notte” as the fiercely intelligent and sensitive wife of a famous and egotistical novelist (Marcello Mastroianni)—a woman who is struggling to rescue her identity in her marriage and in the architectural and intellectual tangle of modernity itself—is among the most essential in all of Antonioni’s films. As Moreau walks alone through the lonely and architecturally oppressive streets of Milan, she seems not just to be thinking but to be thinking about thinking. That’s also why Moreau quickly came to embody an idea that was crucial to the French New Wave—she came to embody history itself. It’s noteworthy that the film that enshrined Moreau as an icon of the New Wave, Truffaut’s “Jules and Jim,” is a period piece set around the First World War. The New Wave brought a new generation of intellectuals and their concerns into the cinema (and proved that the cinema itself was among that generation’s crucial concerns). But when Truffaut, the youngest of the New Wave directors, sought to reconsider French history and culture in the light of his own experience, Moreau was his heroine of free-spirited inventiveness, of freedom tout court, and of the tragically destructive (and self-destructive) passions that came with it. In the following decades, Moreau was cast over and over by directors who sought to unite modernity with tradition. There was Jean Renoir’s “The Little Theatre of Jean Renoir” Luis Buñuel’s adaptation of Octave Mirbeau’s 1900 novel “The Diary of a Chambermaid,” which Renoir had adapted in the mid-nineteen-forties. When Jacques Demy, in his second feature, “Bay of Angels,” from 1963, pulled the stifling and louche bourgeois world and the cinematic crime-drama clichés of Riviera casinos into the blazing New Wave sunlight, Moreau—platinum-blond—was the star. (With her intensely concentrated analytical focus as she pursues the goal of a doomed and reckless passion, it’s one of her greatest performances.) When André Téchiné reclaimed French history through French melodrama in his 1975 film “French Provincial,” Moreau was the star. When Rainer Werner Fassbinder adapted a novel by Jean Genet for the 1982 film “Querelle”—it would be his last film, made in a daring new style—a French period piece in the vague past, Moreau was one of its stars. (She sang in it, too—indelibly.) And in “Gebo and the Shadow,” the last feature by Manoel de Oliveira, which he made, in 2012, at the age of a hundred and five, the prophetic voice from the distant past was performed by Moreau. Her death marks not just the end of an era but of the idea of an era.